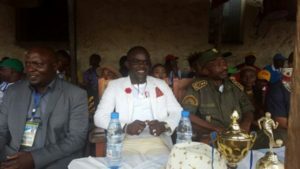 Tiko United FC of E Ward was crowned champions of the first edition of the CY International football competition at the Buea Central Prison after beating Mount Kupe FC of K Ward 3-2 at the finals on Sunday, February 25. In the first time in the prison championship, both teams were elegantly dressed thanks to the cup donor Cyprain Tayong Egomang popularly known as CY International who made sure the players arrived in beautiful regalia. The final that saw the low rated Mount Kupe FC ending the first segment of the game with a 2-1 victory of last year’s champions Tiko United to the disbelieve of many who had earlier predicted an easy ride for the former champions. The lead for the underdogs came few minutes before the end of the first half thanks to a goal from Omarou Sanda who had been a torn in the flesh of the Tiko United back line. As the players of both clubs battle it out on the pitch, fan clubs of both teams could be seen chanting and encouraging their teams to victory despite the slow run of steam. With the first half on recess, Tiko United after a good deal in the transfer market this season, where able to resume play in the second half by spitting fire as they fight their way back into the game. Their efforts were later rewarded when their skipper Emma Chuku leveled tally from a cross that landed on his head to make it 2-2. At this moment, many believed it was not yet over as the current champions continue mounting pressure in order to retain the crown which they won last year. With five minutes to the end of the game, Tiko United scored the third goal which will later be the match winning goal in the classic encounter that has vibrated the inner bowl stadium of the Buea Central Prison. Tiko United carried the day after beating Mount Kupe FC 3-2 to retain their crown. A day earlier, it was Cinyodev FC that had defeated Prison Social Club 24-17 in the CY International Handball Tournament. Prizes and medals were awarded to clubs and players who have stood high throughout the competition. Reacting after enjoying the performance of the inmates in football, business guru and former footballer, Papi London, promised to organise his on prison tournament in May 2018.